Brings universal attachability to AppleScript. Is there a better alternative to UI Actions? Is UI Actions really the best app in AppleScript category? Will UI Actions work good on macOS 10.13.4? UI Actions brings "universal attachability" to AppleScript. It is an AppleScript utility to enhance your control over applications running on your computer. 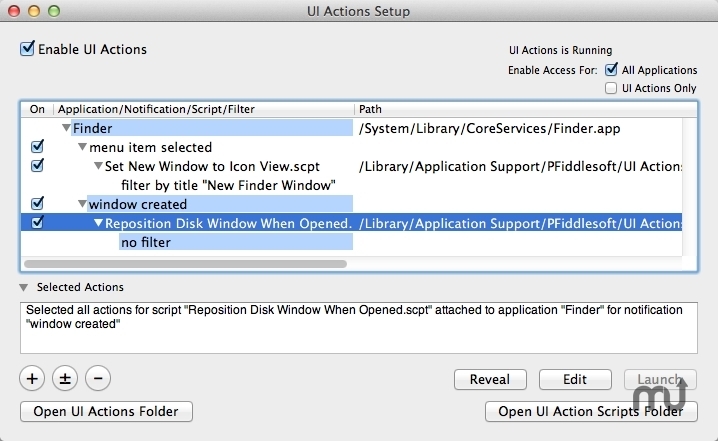 Attach a UI Action script to any standard native Mac OS X application. UI Actions will automatically run the script whenever the user makes changes in the application's user interface. You select the user actions that trigger a UI Action script, such as choosing a menu item, changing the value of a text field, opening a drawer or window, and activating an application. Includes UI Actions Setup, extensive documentation, and many example scripts. adds support for new accessibility features introduced by Apple in OS X 10.10 Yosemite as well as minor improvements and bug fixes. UI Actions needs a review. Be the first to review this app and get the discussion started! UI Actions needs a rating. Be the first to rate this app and get the discussion started!